Looking For Business Start Up Advice? Start on a solid foundation; contact us today to discover how we can help place your business on a solid foundation. Certax Accounting Basingstoke is a professional accountancy and tax advisory practice. We provide expert advice and assistance on a wide range of tax and accountancy matters for small to medium size businesses and individuals. Our experience spans well over two decades. We are a firm of chartered certified accountants in Basingstoke. Contact us today to discuss how we can assist you with our proactive tax advisory service. As Tax Advisory Experts, we have several tips and strategies that we can advise or offer to you and your business with the main aim of minimising your tax liability.Whether you are an individual, sole trader, partnership or limited company, we have up-to-date tax planning strategies and advice ready. As Tax Advisory Experts, we have several tips and strategies that we can advise or offer to you and your business with the main aim of minimising your tax liability. Let us save you the time; completing a tax return can be complicated and stressful. Doing it yourself may result in avoidable errors. Keep accurate books; call us today to enquire into how we can support your business. I am rest assured my business is in safe hands as the additional business advice I receive on a regular basis has moved my company to another level. Olusegun has immense knowledge on Tax, VAT and Accounting and has been quite helpful in sorting out my complicated Accounting issues. He is passionate about seeing businesses flourish, conscientious and very efficient. I would strongly recommend Certax Accounting Basingstoke & Newbury if you require the services of a profound Chartered Accountant. Managing Director, Aspire Cultural Homestay Ltd.
We have been clients with Certax Basingstoke since 2014. The advice received in all aspects of accounting, in terms of both tax and setting up/maintaining our systems, has been extremely valuable. We are confident that when we have any questions, there is always someone there at the end of the phone or e-mail who will respond quickly and assist us with our accounting affairs. Segun has offered fantastic support and advice during the growth of our business over the past few years, all processes are efficient and offer reassurance that submissions are right first time. Certax keep in touch throughout the year with useful tax advice and changes in legislation which is all communicated simply so non-accountants can understand. As a business we would not hesitate to recommend Certax Basingstoke as a provider of all accountancy needs. Certax Accountants Basingstoke are very professional with their work is to a high standards and have always got time to explain any problems. They are honest with a good friendly work force. I have been working with Olusegun Kazim of Certax Accounting Basingstoke since the April 2013. As a new business at that time, and not being someone who knows about the complications of VAT, Tax, PAYE, etc, I needed an Accountant who is knowledgeable, trustworthy, affordable, local, and who didn't mind me asking what must have been a string of stupid questions. Olusegun personally invested time in coming to see me and ran through everything in fine detail so as to enable him to give me the best possible advice, and for me to gain that all important understanding of my responsibilities as a business owner. I believe a major part of a running a successful business is having a good accountant, and thankfully I do. Nothing has been too much trouble, all requests for information actioned extremely quickly and in a language that I understand. I have no hesitation in recommending Certax Accounting Basingstoke, in fact I have already done so to a number of people. They are now enjoying the quality services that I receive. This business relationship has been vital to my company, and one that I know will grow and continue long into the future. I have been working with Olusegun since April 2013 and so far have been very impressed in how quickly he has come to terms with my business and seems to have a good grasp of the financial issues that I am facing. He clearly focusses upon the needs of my business and I have found his approach quite refreshing. His proactive advice is exactly what I am looking for from my accountant and very quickly he has become an integral part of my business. I look forward to a long lasting mutually beneficial relationship. I would happily recommend his services. I just wanted to say how pleased I've been with the help and advice you gave me recently. I've really appreciated how quickly you became involved and how diligently you followed up on my queries with HMRC saving me time and allowing me to focus on running my business. Your communications with me at every stage of the enquiry were very regular and I felt confident that my concerns would be dealt with thoroughly and promptly - which indeed they were. 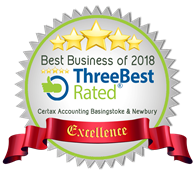 I will certainly be continuing to use Certax Accounting Basingstoke for all my accounting needs and will not hesitate to recommend you to everyone requiring the services of an accountant. For expert advice and assistance on Tax and Accountancy matters, call us on 01256 352937 at Certax Accounting Basingstoke.